WW1 Reenactments Equipment : Great War Tommy WW1 Documents, Paperwork : Booklet Cover - Captured Trenches, Craters, etc. WW1 Reproductions and WW1 Reenactors Equipment / Kit - Booklet Cover - Captured Trenches, Craters, etc. Booklet Cover - Captured Trenches, Craters, etc. 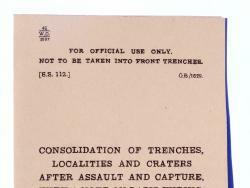 War Office booklet 3197 cover only - "Consolidation of Trenches, Localities & Craters after Assault and Capture, with a note on Rapid Wiring". "Not to be taken into Front Trenches". 1916.